Everybody knows Nerf! It’s the #1 outdoor sports toy brand, and in 2016 sold more than 550 MILLION foam darts – enough to wrap all the way around the planet! Like most kids who grew up in the past 40 years, we have fond childhood memories of shooting Nerf blasters with our friends in the backyard. Kids of today’s generation are getting in on the action with new models, like Nerf Nitro, N-Strike Elite, and Modulus. 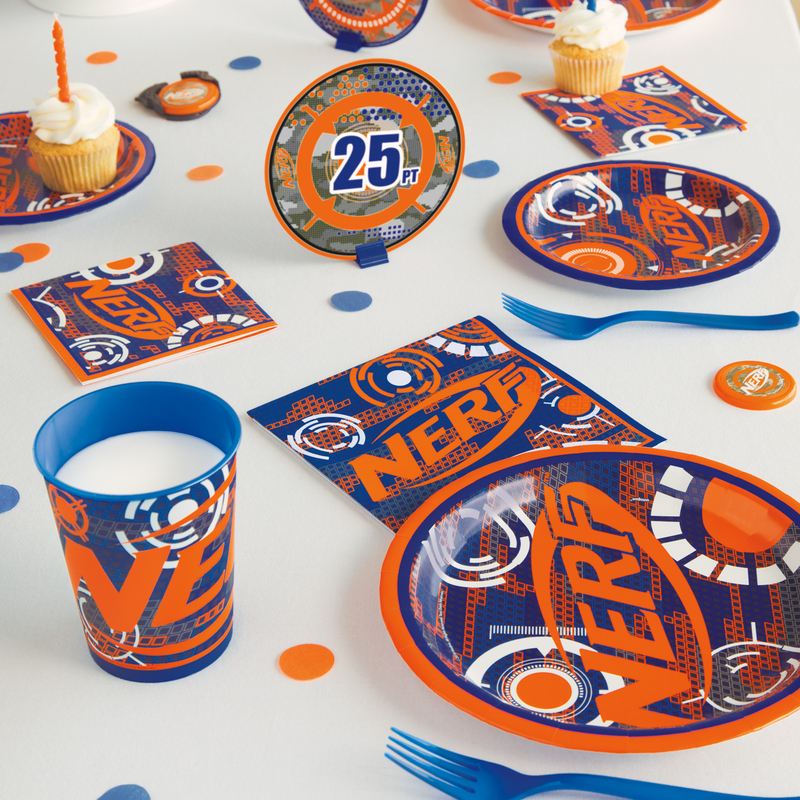 That’s why we are so excited to team up with Nerf on this collection of fun and interactive Nerf themed party supplies. 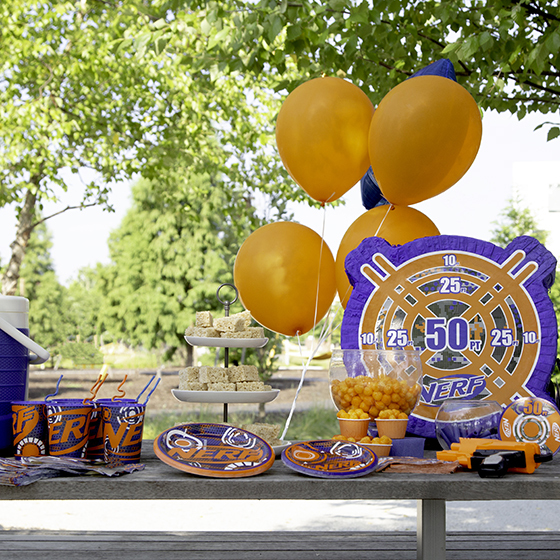 Using our Nerf party tableware and decorations, we created an eye-catching party table to help inspire a kid’s Nerf themed birthday party. We wanted to get some snacks to fit the Nerf party theme, and luckily there are plenty of tasty eats that fit the blue and orange color scheme! Stacks of our Nerf paper plates and napkins look great on the table, and will come in handy when kids are ready to fuel up. After running around all day, kids will be looking to cool down with cold drinks, so make sure to stock up on our Nerf Plastic Cups and Squiggle Straws. When the party is over, kids can take their reusable cups and straws home as Nerf party favors. 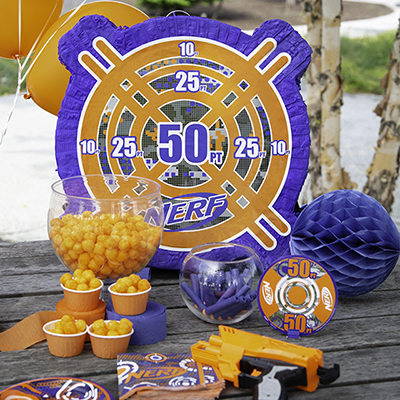 Keep the Nerf theme going with more solid color party decorations in orange and blue! It was super easy to create a DIY balloon bouquet with orange latex balloons and a shiny royal blue foil star. You can also display all the Nerf darts in a bowl or bucket for a colorful decoration that kids can reach into when they run out of ammo. Of course, if you’re having a Nerf party, you’re going to want to have kids play with their Nerf toys. 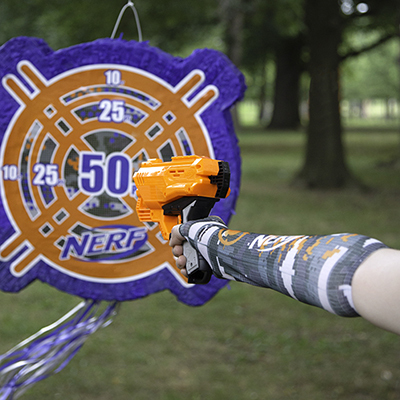 That’s why we designed our Nerf party decorations to double as Nerf shooting targets too! Our Nerf hanging decorations, centerpieces, and even the pinata are printed with targets that kids can take aim at with their blasters. To highlight this awesome feature, we created a Nerf shooting range. 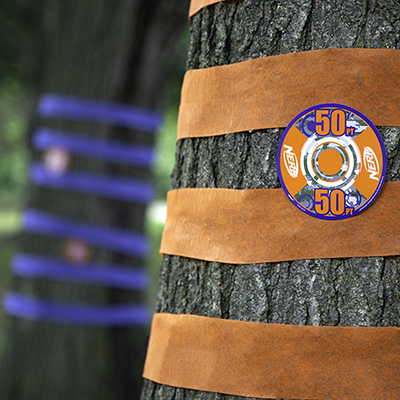 First, we wrapped the trees in blue and orange crepe paper streamers to add some extra color and to also show kids where the targets were located. Then, to avoid having kids firing at the snack table, we took the Nerf Centerpiece Decorations out of the plastic stand that comes with them and taped them to a tree. 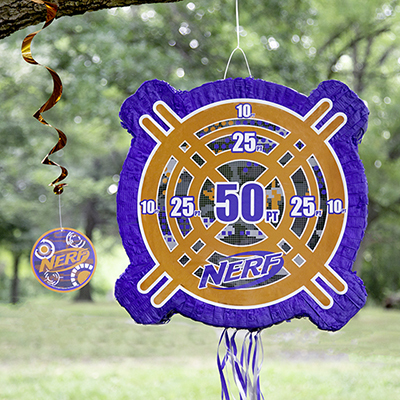 These Nerf decorations have different point values, so be sure to put the higher numbers in harder to reach areas. Finally, we hung up the Nerf Pinata and the hanging decorations for additional moving targets. Once you have all your targets in place, use our Nerf party accessories to divide kids up into two teams: blue and orange. Kids can wear our orange and blue Eye Black Stickers and Arm Sleeves to distinguish the teams apart (and to get them psyched up for the epic Nerf battle that’s about to go down!). This summer, get the kids off the couch and get them playing outside with an action-packed Nerf party! 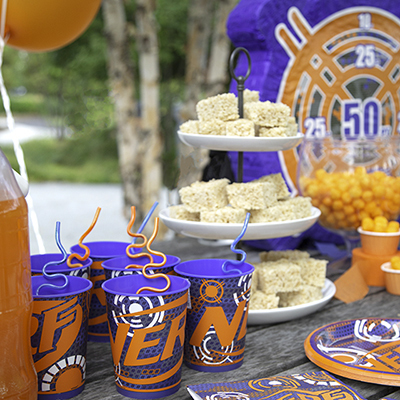 All our Nerf birthday party supplies are now available online and in-store. Game on!